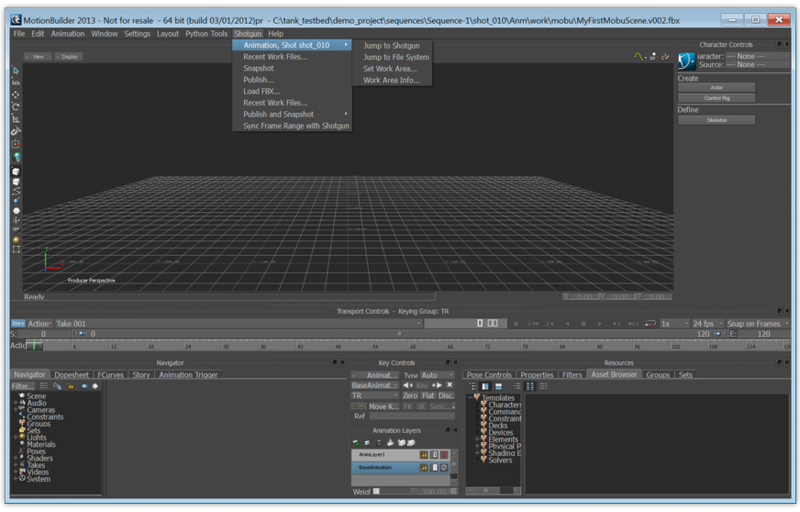 The Shotgun engine for Motionbuilder establishes a bridge between Shotgun Pipeline Toolkit apps and Motionbuilder. It also contains a PySide distribution, which is designed to connect to the QT inside of Motionbuilder, making it possible to write apps using Python and PySide that run right inside the Engine. This item has been tested and is known to be working on the following application versions: 2016-2019. Please note that it is perfectly possible, even likely, that it will work with more recent releases, however it has not yet been formally tested with these versions. 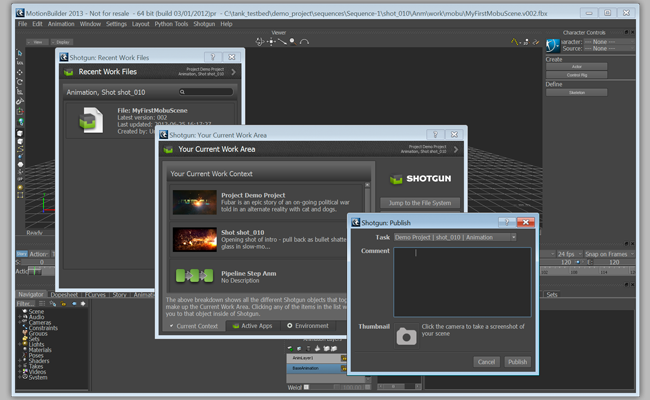 The Shotgun engine for Motionbuilder contains a standard platform for integrating Shotgun Pipeline Toolkit (Sgtk) Apps into Motionbuilder. It is light weight and straight forward and adds a Shotgun menu to the main menu. If you have access to the Shotgun Pipeline Toolkit, you also have access to the source code for all apps, engines and frameworks in Github where we store and manage them. Feel free to evolve these items; use them as a base for further independent development, make changes (and submit pull requests back to us!) or simply tinker with them to see how they have been built and how the toolkit works. You can access this code repository at https://github.com/shotgunsoftware/tk-motionbuilder. You need Shotgun Pipeline Toolkit Core API version v0.18.23 or higher to use this. Support for v2019, PySide2, core 0.18 and misc changes. This version of the engine is not compatible with versions before 2014. Engine now requires core v0.18 or later. Adds support for mobu 2019, PySide2 and cleans up the engine payload. Removes deprecated config params debug_logging and use_sgtk_as_menu_name. Now ensures that the folder is created, before saving the workfile during publish. Uses new API methods for file system lookups. Added an icon to the engine bundle. Added support for automatic reload. Fixed a unicode related bug in the menu handling.